The two buttons that make up this pendant fit together so well, it's almost like they were made for each other! They're both French antique but despite their difference in style, they really complement each other. The base, gold button is acrylic with (what looks like) a piece of metallic fabric pressed inside. This gives the button a subtle weave and shine that catches the light beautifully. 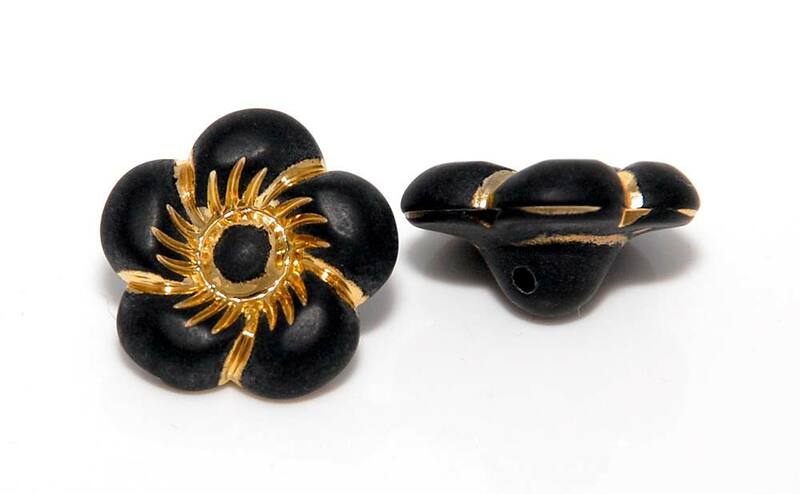 The black and gold rose button is also acrylic with a matte black finish. The gold details looks like some foil has been applied to the surface by hand as they're all a little different. Their shininess contrasts nicely with the matte black of the button. In order to stack the buttons on top of each other, I filed away the rounded base of the flower until it was flat and then glued them together. The rose rests neatly in a small depression in the gold button. After that, I added a tear shaped black bead and some cream coloured pearls to the pendant. I finished the piece by hanging it from a double strand of sparkly gold chain. I really like the possibilities of combining different buttons to make an entirely unique piece! Sometimes, like this pendant, the buttons really complement each other. At other times, their differences brings about something completely unexpected.